Hey guys! 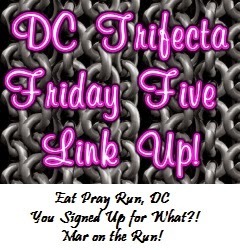 I am linking up with the DC Trifecta again on this gorgeous, sunny and, cool Friday: Courtney at Eat Pray Run DC, Cynthia at You Signed up for What?, and Mar at Mar on the Run. Some may say it's too cold here in Chicago, but 61 degrees is right up my alley :) This week's theme is a 'Free Friday'– meaning, the choice is ours. 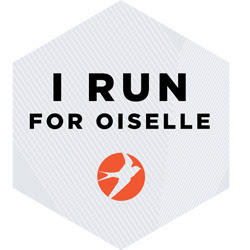 I've decided to list 5 running products/items that I am loving right now. 1. New Balance Momentum 2 in 1 Shorts. You guys, these were the dream shorts I had been searching for. I've worn them during half marathons and NOT ONCE did I have to pull them down. No more fidgeting with my shorts. No more having to pull them down every 5 minutes when they ride up. They stay put, and that's what I've been on the hunt for (I loathe when my thighs rub against each other, even if I have on Body Glide and there isn't any chafing happening, I just don't like the feeling). I love the material—so light. I honestly didn't expect to like love them so much, because I didn't believe they wouldn't ride up. After all, there is no grip on the inner shorts, and they aren't very tight on my leg, so I just figured I'd be pulling them down during my runs. NOT ONCE. They're amazing. The inner short has a 5.5" inseam, and the outer short has an inseam of 2.5". 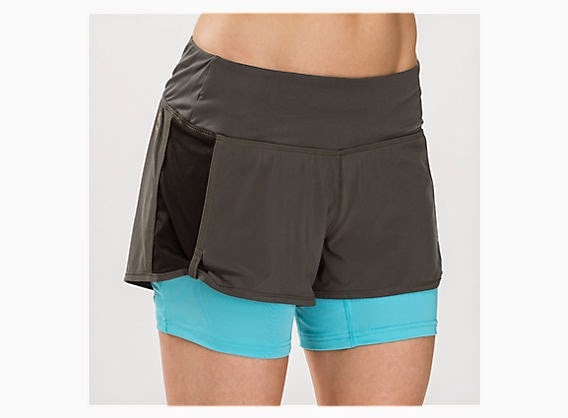 It has Lightning Dry® technology (wicks away moisture to keep you comfortable and dry – a must for any running attire, in my book), the waistband is comfortable, and there is some reflectivity on the front and back for safety and visibility. 2. 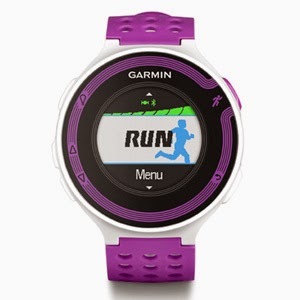 Garmin Forerunner 220. I am loving my new watch! It's so lightweight, I barely even notice I have it on. I also enjoy that it vibrates and beeps at every mile (you can set your 'laps' at whatever distance or time you like; I prefer to keep it on the miles). Another feature I have enjoyed is the bluetooth connectivity so that it will upload my run info immediately, unlike my Nike+ that I had to plug in to my computer after each run. So much more convenient. I charged it last Friday before my half on Saturday, and then continued to use it through Thursday without charging it again. When I plugged it in Thursday, it was still at 40%. That's amazing. I know there is so much more the watch can do, I just haven't had the time to play with it as much as I'd like. 3. My Road ID* bracelet. I purchased the Elite a while back (it has a watch-like buckle clasp), and wear it on every run. Sometimes I even just wear it out. A few summers back, I was having issues breathing and feeling nauseous/like I was going to pass out, so I wore it in case I did. I'd be easy to identify if it came down to it. Luckily, I never did pass out, but it was nice to know I was covered. I'm sure I've mentioned this before in another post, but it's one of my running essentials. If something were to happen to me while out for a run, it's nice to know that if I can't speak, they can still identify who I am and contact the important people. God forbid that ever happens, but it does put my mind at ease (even if it's just a little) to know that the info is there on my person. Plus, they have so many options for wrist band colors (I have pink and blue), so if you get bored you can switch it up. 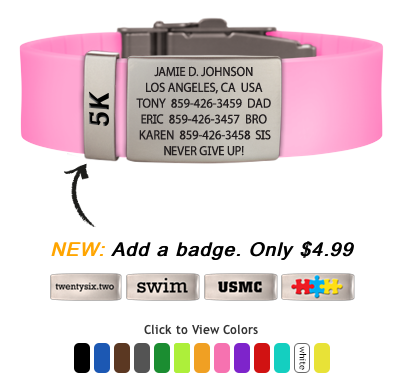 They also just recently came out with badges that you can add to the wristband (5K, 13.1, 26.2, etc. ), which is another fun way to accessorize. I would urge anyone that does not use Road ID* to go buy one now. 4. Nuun. Perhaps you know this about me already, but I am not a lover of plain water. Sometimes it hits the spot, but usually I want some flavor. In order to hydrate more, I decided to give Nuun a try. It is fantastic! The flavors are so light, that it's just a hint of flavor, and not an overwhelming taste. A few of my favorite flavors are Cherry Limeade, Strawberry Lemonade, Lemon Tea, Fruit Punch, and Tr-Berry. I know, that's most of them haha. I also love that they have different kinds – Energy (contains caffeine for an energy boost along with electrolytes), Active (electrolytes), and All Day (natural hydration) – so you can find the perfect tablet for any time of day, depending on what you're up to. There's no sugar, artificial flavors or colors, or high-fructose corn syrup with only about 7 calories per tab. Sounds (and tastes) good to me! 5. Yurbuds. I mentioned these in my Friday Five: Five Things in My Gym Bag, but thought they were worth mentioning again in more detail. I have the Inspire Pro for Women in Aqua. 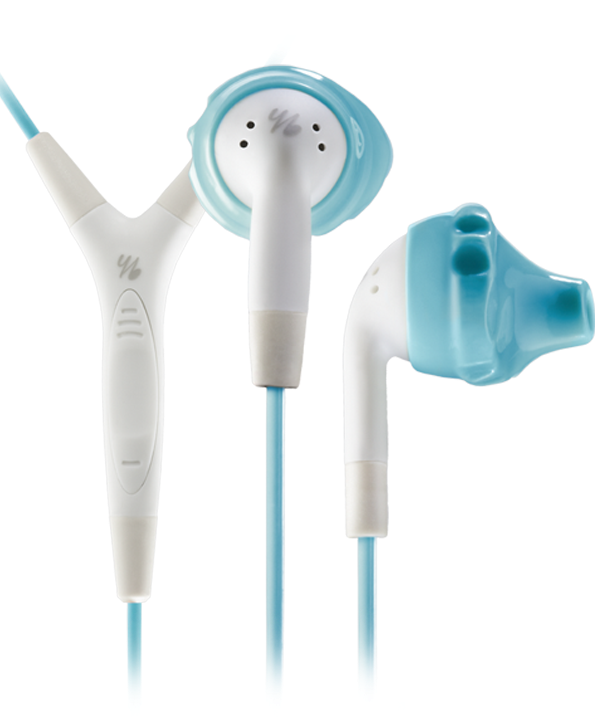 I used to use the Ironman Yurbuds Inspire Pro (which it appears are no longer sold on the Yurbuds website), because they had the 3 button dry mic, which wasn't available yet for the Women Inspire Pro (at least not that I could find), but only the regular sized Inspire Pro. I really like the ones geared towards women, because they are designed specifically to fit smaller ears. Even with the different size earbud pieces with the Ironman ones, they were still a bit large for my ear. I ended up losing an earbud, so decided to purchase a new pair, so went with the Inspire Pro for Women, and am happy I did. I like having the ability to control my music and volume from the Yurbuds rather than having to take my phone out and play with it, hence my need for the 3 button dry mic. I love that these earphones don't fall out of my ears, unlike most other brands. I am no sound expert, but it all seems good to me, and obvisouly the sweat and water resistance is a must have for earbuds that I run with. What are some of your favorite running products/items at the moment? Any must-haves? Essential items you can't go running without? Would love to hear your recommendations! Thanks to Courtney, Cynthia, and Mar for hosting! Make sure to check out their "Friday Five" posts (links to the specific posts are at the top of the page) and link up if you are joining in! There are always a lot of blogs linked up, and it's interesting to see everyone's takes on the theme, with this week's being especially fun and varied. I suggest taking a look at a few (or all, if you have the time). Have a great weekend, everyone! I have a plain old Road ID but I love the custom ones. I had no idea you could add those badges! I had wanted to try yurbuds and hoped to get them for Christmas but I got snug buds instead which I can not use so gave them back to my mom. Yeah, the badges are a fun little extra! How come you can't use the snug buds? Do they not fit well in your ears/don't stay in? I've heard some people really like them, but figured since Yurbuds work well for me, there's no need to fix what's not broken. I hear you! I need to buy a few more pairs :) That's smart to wear it even when with friends. I'm looking in to trying some skirts – what brand do you prefer? I have the same problem with shorts that you do, I'll have to look into the New Balance ones! Sorry you have the same problem, but it's nice to know I'm not alone! It seems I need the kind that are a bit longer, and can't wear the short shorts because I get annoyed haha. If you get them, I hope you love them as much as I do. 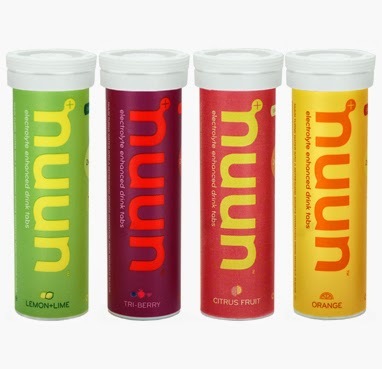 Oh I am obsessed with Nuun! I drink it after long hikes too! 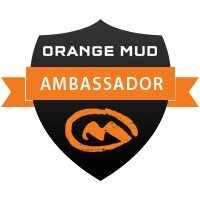 And your post seriously makes me want to get RoadID. I know I should get one, I just hate spending money on stuff since I'm so poor. Boo. Yay Nuun! They also have a free Road ID app you can use – it gives you the option to create a lock screen image with emergency contact info along with your name and any important details (ie allergies, medical history, etc). You can also send messages to people while out on a run so they can track your progress (spouse, roommate, family member). Looks like it's pretty neat. I've been wondering about these tights/shorts. Are they for people who don't feel comfortably in tights? Because I totally get that. It's why I prefer running skirts. They can be, though not necessarily. A lot of the tights on their own I find too constricting, or too short, or too thin of a material. I prefer to have a thin, long tight-like short with some extra coverage of the looser, outer layer, if that makes sense. I'm not sure skirts are for me, though I'd like to give them a try. I've noticed some seem a bit too bouncy for my liking, though they are super cute. Which brand do you prefer? I love Yurbuds! My old earphones used to shock me (scary, right?) so it was nice to find a comfortable, nonelectrocuting pair! Yikes – that's crazy! I'm glad you found a pair that works for you, and ones that don't shock you!